Bacau, 1994 - 2004: I needed to have a laugh. Medical recommendation worthy of consideration, although little attention is given: do not search for a pleasant TV program making use of the remote control! Grab a TV magazine, make your choices and tune in at the time the program in question starts. As of 1996 I subscribed to "TV Satelit" magazine that showed the TV listings for a fortnight. The magazine also contains other stuff, among witch a page or two with culinary up-to-date information where television celebrities showed off, sometimes even males. It was amusing to read "special" recipes the authors of which had their professional schedule too busy to write recipes. In response to that I have once written down on a piece of paper what sort of food I have prepared when I was in a special state of mind (Bachus state). 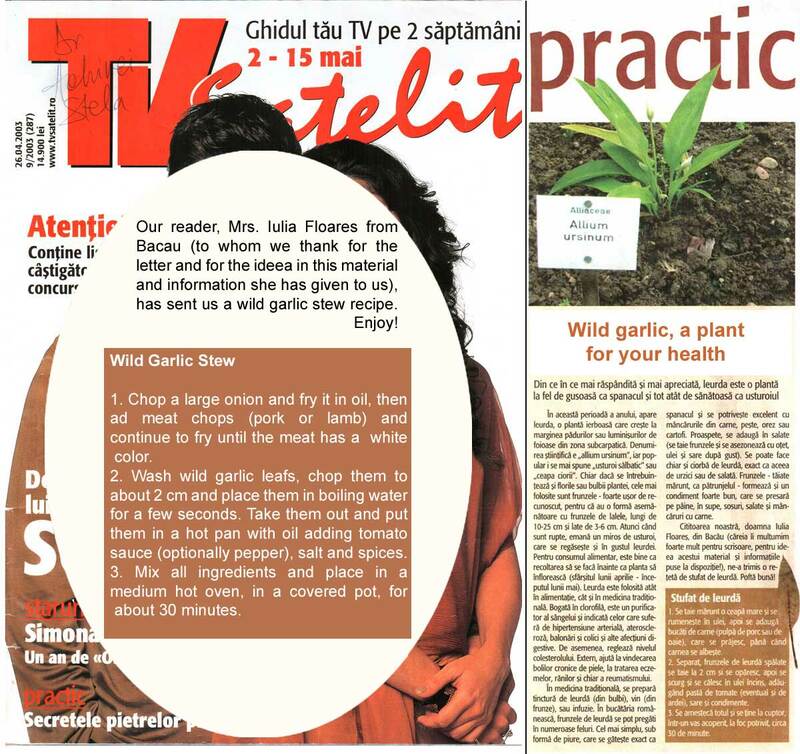 Therefore, next year, before the beginning of the picking season of wild garlic, I sent a documented writing to which I attached my "original" recipe. Since the capital city is full of all-knowing persons, I signed my letter as Iulia Floareş in order to trick the publisher and get the recipe published in their magazine. And it was published in no. 9/2003 of April 26, page 58.